THE second of the series of public meetings organised by Sinn Féin’s Cuige Uladh to mark 10 years of the Good Friday Agreement and one year of restored political institutions took place in Strabane . The Sinn Féin President Gerry Adams MP MLA will use the opportunity to comment on PSNI Chief Constable Hugh Orde’s suggestion last week that Sinn Féin would make 2008 his ‘toughest year yet’. “Last year Sinn Féin committed our representatives on the Policing Board and the DPP’s to working hard to ensure that the PSNI is a publicly accountable police service capable of meeting the needs of local communities. Sinn Féin makes no apology for seeking to fulfil this commitment. Our experience in the 14 months since then has convinced us that the PSNI is in some respects still not up to the job of a civic and fully accountable policing service. This is obvious in my own constituency as well as other areas. I have no doubt that the PSNI want to move into a new policing dispensation and it is important to acknowledge that progress has been made. However among other issues there appears to be a failure to accept that a new policing dispensation includes the right of citizens and their public representatives to comment on policing matters, particularly as occurred in west Belfast recently, in the wake of serious crime. There is concern about public and community safety and about how the PSNI is dealing with these issues, and Hugh Orde can be assured that Sinn Féin will raise these concerns in a consistent and constructive manner. Sinn Féin takes its responsibilities in this respect very seriously and there is clearly a more focused approach since our representatives went onto policing structures. 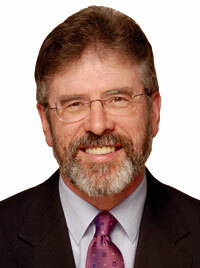 “Orde cannot blame the families or Sinn Féin or anyone else for the cost of public enquiries. The fact is that the PSNI has not been open and transparent. In fact Hugh Orde has refused to co-operate with these enquires and a whole series of inquests. This has thwarted the efforts of families to get to the truth behind the deaths of their loved ones.